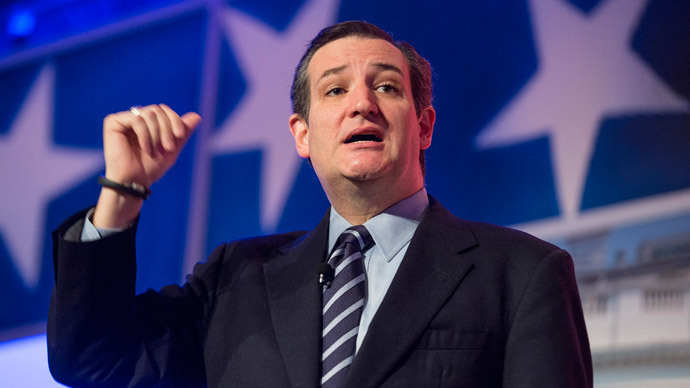 United States Senator Ted Cruz (R-Texas) has officially entered the 2016 presidential race and has unveiled an ambitious agenda if elected to the oval office. Sen. Cruz announced early Monday through his Twitter account that he’ll be vying for the White House in next year’s election. He is the first prominent member of the Republican Party to officially declare their intent to run for the nomination. “It’s going to take a new generation of courageous conservatives to help make America great again, and I’m ready to stand with you to lead the fight,” the former solicitor general-turned-US senator says in a campaign video attached to the tweet. At an event at Liberty University in Lynchburg, Virginia on Monday morning, Cruz spoke publically for the first time about his plans to run. “It is a time for truth. It is a time for liberty. It is a time to reclaim the Constitution of the United States,” he said. Cruz, 44, was elected to the US Senate in 2012 and has since become one of the Obama administration’s fiercest critics in Congress. Among the lawmaker’s targets during his short span on Capitol Hill have been the president’s hallmark health insurance legislation, the Affordable Care Act, and the administration’s efforts concerning illegal immigration. During his address in Virginia, Cruz said he’d repeal the health care mandate and even aim to abolish the Internal Revenue Service if elected president. “Instead of a tax code that crushes innovation, that imposes burdens on families struggling to make ends meet, imagine a simple flat tax that lets every American fill out his or her taxes on a postcard. Imagine abolishing the IRS. Instead of the lawlessness and the president’s unconstitutional executive amnesty, imagine a president that finally, finally, finally secures the borders. And imagine a legal immigration system that welcomes and celebrates those who come to achieve the American dream,” he said. Additionally, Cruz told attendees at Monday morning’s address that, as president, he’d “uphold the sacrament of marriage,”ensure “every child in America has a right to a quality education” and aim to protect the Second Amendment’s right to bear arms. “Instead of a president who boycotts Prime Minister Netanyahu, imagine a president who stands unapologetically with the nation of Israel,” Cruz said to a round of applause. Although the senator is the first big name from the GOP to announce plans for the White House ahead of the 2016 election, no major names from the Democratic Party have declared their intent yet. Nevertheless, Hillary Clinton, the former US Secretary of State is widely presumed to be a likely Democratic nominee. During the annual Conservative Political Action Conference last month, Sen. Rand Paul (R-Kentucky) was placed first in a straw poll among potential 2016 Republican Party candidates, followed by Wisconsin Governor Scott Walker and Sen. Cruz.